Using a PRO-680DN28 box security camera from CCTV Camera Pros, this video demonstrates the angle of view and zoom level capability of a 2.8-12mm varifocal lens . A 2.8-12mm lens can be adjusted by an installer to any setting within that range. These videos show the 2.8mm and 12mm setting, side-by-side so consumers can see the widest and most narrow settings that this lens supports. For more information on the PRO-680DN28 box camera that was used in this video, please visit this page. This video demonstrates the variable range of view and zoom of a 2.8- to 12-millimeter vocal lens using a Box security camera from CCTV Camera Pros. On the left screen, we have the lens adjusted to the 2.8-millimeter setting which is the widest view. The video on the right displays the lens adjusted to the 12-millimeter setting, which is the most narrow and zoomed-in setting. The garbage dumpster in the background is exactly 100 feet away from where the camera is mounted. In the 2.8-millimeter video, the man stops eight feet in front of the camera. In the 12-millimeter video, the man stops 16 feet in front of the camera. Using a camera with a 2.8- to 12-millimeter varifocal lens, security installers have the flexibility to adjust the lens to any angle of view within that range. This video shows the extreme minimum and maximum that this lens is capable of. 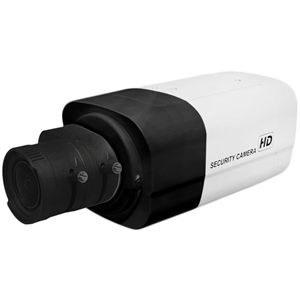 In addition to being available on Box-style CCTV cameras like the ones used in these videos, the 2.8- to 12-millimeter varifocal lens is extremely popular for all types of CCTV and network IP security cameras. For more information on the Box camera and the varifocal lens that was used in this video, please visit www.cctvcamerapros.com/pro680dn28. Thank you for watching. Click here to learn more about the PRO-680DN28 Box CCTV Camera used in this video.